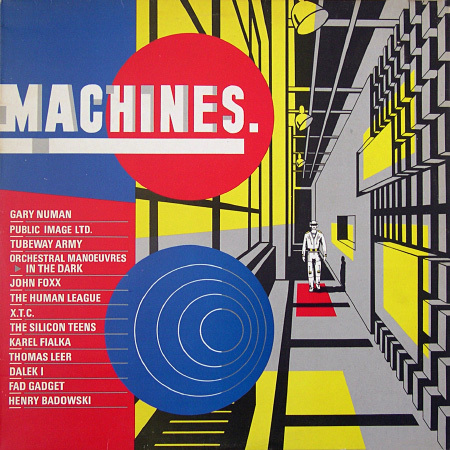 ‘Machines’ was a compilation album from late 1980 that showcased a few of the Virgin records/DinDisc roster, while also including a smattering of established names (Gary Numan/Tubeway Army, John Foxx, Human League, Fad Gadget, Orchestral Manoeuvres in the Dark) and up-‘n’-coming names too (Henry Badowski/Karel Fialka/Silicon Teens/Thomas Leer). 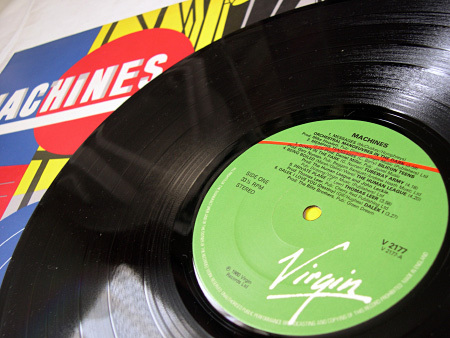 The Virgin records contingent was a mite biased perhaps, with two names in particular seemingly odd bedfellows for such an obviously ‘synth’ themed compilation, namely XTC and PiL. ‘The Somnambulist’ by XTC first appeared on the double-pack 7″ single for their ‘Generals and Majors’ single from earlier in 1980. It drifts along nicely and is in stark contrast to the abrasively jangly guitar-packed and drum-propelled stuff that the rest of the ‘Black Sea’ album was hewn from. 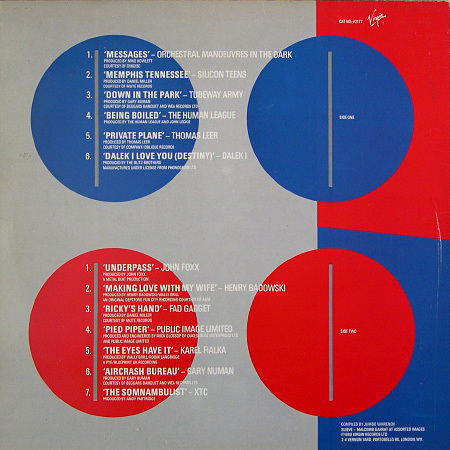 At the time, the main point of interest for the compilation was the previously unreleased ‘Pied Piper’ by Public Image Limited (PiL) – a short, fairly noisy piece that probably fits closer to the ‘The Flowers of Romance’ style (which was of the compilation’s period, though not released until the Spring of 1981), the one and only piece recorded with the late Steve New as part of a short-lived dalliance with PiL. (See http://en.wikipedia.org/wiki/Flowers_of_Romance_%28album%29#Related_tracks) This track eventually resurfaced in the late ’90s on PiL’s ‘Plastic Box’ compilation of CDs. As seems to happen fairly often with these kind of compilation albums, when released in foreign climes, the track listing varies, presumably down to licensing issues, or just tastes of the territory. Versions of the compilation from New Zealand and Germany drop the tracks by Dalek I and Henry Badowski in favour of ‘Crash Course In Science’ by Kitchen Motors and ‘Rapido De Noir’ by Irmin Schmidt & Bruno Spoerri. This entry was posted on Sunday, January 29th, 2012 at 10:44 pm	and is filed under Compilation albums. You can follow any responses to this entry through the RSS 2.0 feed. You can skip to the end and leave a response. Pinging is currently not allowed. Ah. I remember this great New Wave compilation. It’s one of those records that I saw but didn’t buy; mainly because I already owned 70% or more of it already! It’s the type of record, were I to come across it in the bins now, would be very hard to pass up, just on the principle of the thing. I think the ultimate record of this type; where I own virtually all that comprises it elsewhere, yet would be utterly powerless not to buy it is the amazing K-Tel New Romantic compilation Modern Dance! sorry, late-comer here ! The best thing about this being on Virgin and not ‘Kan’t-Tell’ [as we call it] is the quality of the pressing. 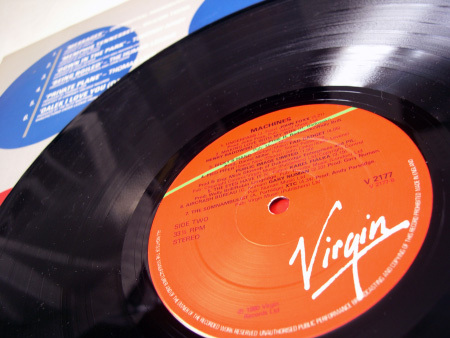 Virgin have got a max of 7 tracks each side here whereas Ktel crammed 9/10 tracks aside, the quality was shocking ! The ‘Modern Dance’ comp is good example on how bad they were . ‘Methods Of Dance’ was even better with 4/5 tracks a side. Stuck in the small village of Vancouver, Canada in 1980, I snapped this up when I saw it. Back then, most of this material was only available where I lived on compilations. I still have it packed away with boxes of vinyl somewhere. the cover is marvelous too !